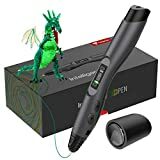 Great with #3 7TECH 3D Printing Pen. I’ve had this for a few days now. It is really easy to change the colors, and the LCD display is sweet and hi-tech. Avoid LIX PEN, it is nothing more than a piece of junk. After 2+ years of waiting (yes! this is how late they were with delivery!) I was expecting much more. Not only the performance was mediocre but… it broke after a short use! And they made me pay for sending it back to them for replacement unit. As for the replacement pen – it is… a BETA version of the product! What was the original pen that I got then? An Alpha? The whole LIX company is a joke! Do not buy LIX pens horrible company and awful product. I am in love with #3 7TECH 3D Pen. Took me a little time to get the hang of it. My friend however who is actually artistic was drawing these amazing pictures the moment she got it. It is easy to use, just like a pin. Am saving up to buy a 2 one as a gift for my friends. Who’s editing this article? I just cannot respect the information as much when there are spelling and grammar errors. Otherwise, it’s an enlightening article. Have you tried writng in Romanian? If English is your second language, you are going to make some errors. This is just nit picking. I read it through, and the reviews and his advice to not go with Lix now due to the errors discovered. Not many people would be honest enough to recant a good review. Have to say that this response is pretty irrelevant and likely from someone who perhaps thinks the whole world speaks English as a first language. The best 3D pen might come from 3D Dreamer. If you put the following into consideration. Control of filament flow, how well can you control the filament flow in the air? Just letting you know that you are leading consumers astray by recommending the Lix Pen at all. After paying $220 aud to get one for my mum for christsmas it doesn’t work at all & they’re refusing to refund. Upon further research it turns out this has happened to many purchasers of the Lix Pen, & that they are considered frauds by Kickstarter after ripping their backers off. I bought the pen after reading this (& other) review & can’t help but wonder if this review is based on profit rather than fact. I am extremely sorry for your terrible experience with LixPen. Actually, the pen which I received from them for reviewing purpose worked like a charm and it is still working. I will contact lixpen on your behalf, and see what I can do for you. Other than that, I will re-review their Pen by ordering a new one. I had the same experience as Bec. Please take their pen off your page. There are going through very similar situations. And they haven’t even send these pens to their backers. We appreciate your concern and that of other several buyers who had a disappointing experience with Lix pens. We have highlighted the product with a warning for readers as not to buy it until we get our satisfaction about the product. Once again thank you for sharing your experience with us as it helps the community in making the right decisions. Can you please tell me that if i should buy LIX or not???? Because i like this pen a lot. Bt reviews werent good last year. So if you can help me???? We have also been receiving some complaints about Lix pen may be you should pick up some other model from our list until we get our satisfaction by a thorough look into this matter. So the 3d Simo Mini was awesome…..for about a week till the feed mechanism broke. 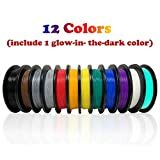 I literally just got spools of ABS and PLA filament as well. SO i haven’t been able to heavily use my 3d Simo MINI before it broke. After that i found a spot for comments on Kickstarter that had a lot of people still waiting on orders or frustrated because their pens seemed sub par. Such a shame, because it’s incredibly awesome and different from others. But I’m sorry, DO NOT………support 3d Simo Mini until the creators fix problems with the pen and start supporting their backers!!! Such a shame but when you don’t reply to customers or live up to warranty promises, your BUSINESS SHOULD’NT BE ALLOWED TO BE ADVERTISED AND SHOULD’NT BE ON KICKSTARTED ANY LONGER!!! Before buying a 3D Lix Pen I would read all comments and research. The company states “Please understand that we are a company which produces electronic hardware, those products tend to fail or malfunction from time to time, as all electronic products do.” My Lix Pen did not work out of the box. I paid postage back to the company “only to be told I had to pay more because the Lix Pen was being held by customs. When I asked for a full refund I was told they do not give full refund on used/damaged Lix Pen. “It didn’t work out of the box.” So I repeat. Before you buy a 3D Lix Pen read all comments and research. Why don’t you update the 3Doodler entry to Create or Start? They are vastly better than they used to be…and their accessory range in 2017 is really nice. Just saw them at NY toy fair and I was impressed. Btw – I just received my LIX pen…massively disappointed with it. Can only hope they make a V2 soon. Read some reviews of this pen on Amazon – most were negative. So who do you believe? I just want a pen to design unique findings / mountings for semi-precious jewellery. Something different to either having them set in resin, or buying gold or silver findings made by other companies. I purchased a 3D Doodler a while back. It was great the first time I used it. It burned up the second time I used. It was total junk. I also ended up with a lot of ABS filament. 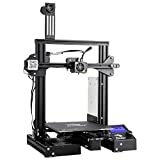 I want to find a decent 3D pen that I can use this filament in. What Pens uses TPU instead of TPE? since now TPU is the new, stronger filament of the two I would like to use a pen that is built for it, and has this ThermoPlastic Polyurethane in stock. 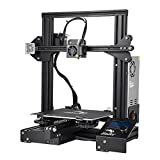 You need to understand that the temperature is the only thing that matters find a pen that can print up to like 230c thats about the max tpu is printed at. Also you can buy tpu from anywhere it doesn’t have to be wherever you buy the pen from. The pens don’t use proprietary filament they are usually if not always 1.75 standard filament. Amazon has plenty of tpu in 1.75 in stock. 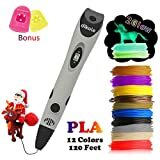 what would you suggest for a 10 year old who has never used a 3d pen? 3doodler? Stay away from the 3dSimo mini. It burned up after 10 minutes of use and the company will not respond to emails or letters. A very expensive piece of junk. Hi Edward, which pen you will suggest me when I’ve a low budget but my requirements are high? Please suggest with your own experience. Thanks. Stay away from 3D Simo. I received my pen November 30, 2017 and it has never worked. I’ve tried all the emails, the support email, the Facebook emails, and the phone number on my credit card statement to contact them to no avail. I finally reached out to the credit card to stop payment and investigate this bogus company. No reputable dealer should advertise or sell this product as the company is a scam. Yep, I no longer recommend them to anyone. I don’t know what happened to them… would not take the risk buying from them. Edward, which pen now you are using? And what is your own experience? Thanks. In my humble opinion. This is a great pen. I have tried another 3D pen and the additional controls of temp., speed and ABS or PLA are super useful. The piece in my photo is 3 ft. tall and many hours. My other pen didn’t last long enough to finish one previous piece and it was less than half this size. This is the 3D pen to get. This is what I was looking for. Really A fantastic Review on 3D Printing Pens. Thanks! Great review I’ve been looking at buying a 3D pen, Glyby Intelligent 3D Printing Pen Is one I’m interested in now. Just had the chance to try the new UV of LIX PEN and it seems really another story, the speed, extrusion quality is impressive. Finally, the nice design is giving a nice experience too… telling you that because I had used the previous generation and it wasn’t the same at all. Excellent review dude, thanks for your input. I just bought your best professional pen for my brothers birthday, he loved it.